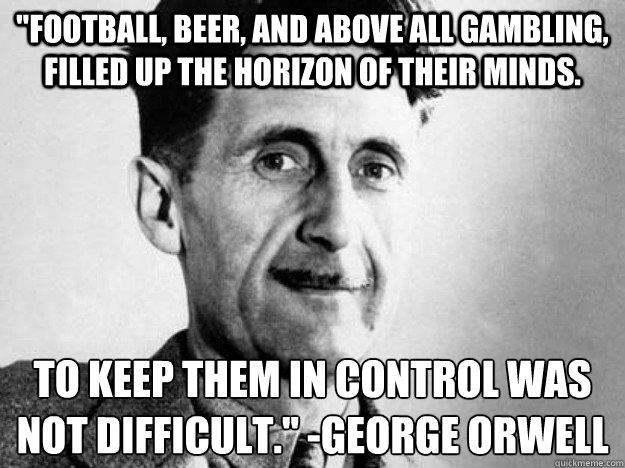 This entry was posted in Politics, Quotes and tagged 1984, Football, George Orwell, Quotes by Impartial Juror. Bookmark the permalink. Well I must admit to enjoying beer. Placating the citizens with “bread and circuses” is the important part. I love to pick on football but I have my vices too. The difference, I hope, is that I’m (we’re) politically engaged and not just passively accepting the status quo.